If Christmas Eve is more for the stable and the manger and the mother and the babe, then Christmas Day is for considering what these things mean. This reading is full of deep meaning about the love of God—how God loves us so much that he sent his only Son into the world, that we might live through Him. We are set free to live through Him, by the forgiveness of our sins. Christ was born, became human, to give his life for us—literally. God sent his Son to be the expiation for our sins. In a Great Exchange, Jesus, the sinless one died for our sins, that we, the guilty, might not die, but live! This is the good news! The incarnation of our Lord took place so that Jesus, Son of God and son of man, might die for us on the cross and be raised to new life. As we said at the beginning of Advent, the incarnation is directly related to our redemption. No one else could effect our salvation. No one else could be the expiation for our sins. In this is the love of God, that He sent His Son into the world, for us. 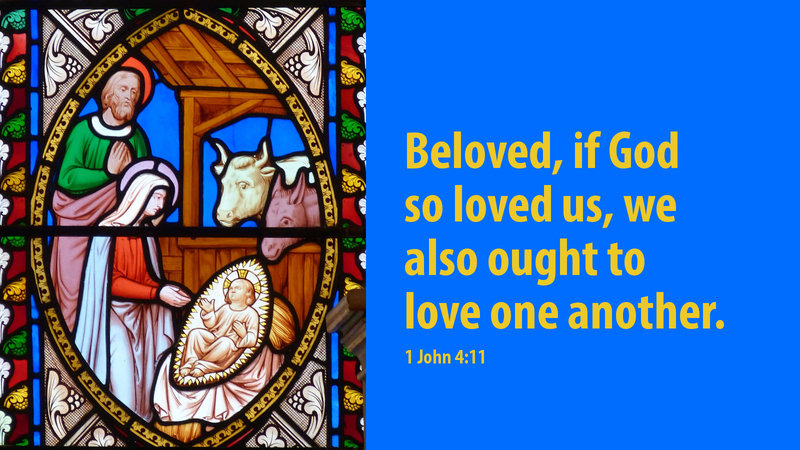 And now John says, “Beloved, if God so loved us, we also ought to love one another.” There is no “Advent Action” for Christmas Day, as we are through Advent for another year. But John calls us to action. He calls us—invites us—to love another, as God so loves us. In the coming year of the Lord, may we love because God loves us. May we love with a Christ-like love that is selfless and self-giving. May we think less of ourselves and more of our neighbor—the neighbor in the next room, the neighbor next door, the neighbor down the street, the neighbor around the world. Because God so loves us, we are to love one another. May God’s love strengthen and encourage you throughout the New Year! Thank you for the chance to share Advent with you! Prayer: Lord God, we give you thanks for your love, manifested for us in the gift of your Son. Now, let us love one another! Amen. Thank you for these Advent devotions!! Blessed Christmas and New Year.